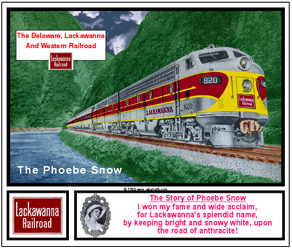 The Delaware Lackawanna & Western RR was the Route of Phoebe Snow. 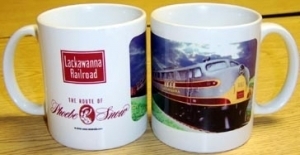 Steamtown National Historic Site maintains many Lackawanna exhibits and preserves much history of Americas Steam Heritage in Scranton, PA.
Lackawanna RR Coffee Mug featuring the beautiful Phoebe Snow streamlined passenger train pulled by E-diesels in their as delivered paint scheme. 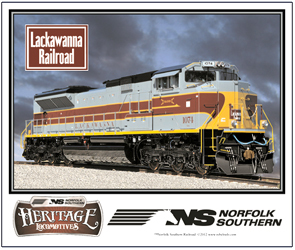 Delaware, Lackawanna & Western Railroad, the route of Phoebe Snow, these FT diesels are pulling their duty in rigorous mountain service. 6 inch x 6 inch square tin logo sign of the Delaware Lackawanna & Western Railroad, the Route of Phoebe Snow. 6 inch x 6 inch square tin logo sign of the Delaware Lackawanna & Western Railroads Phoebe Snow, mythical rider who always wore white and never got them soiled on the Road of Antricite, a clean burning coal. 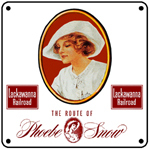 Classic Lackawanna Logo License Plate, the road of Phoebe Snow. 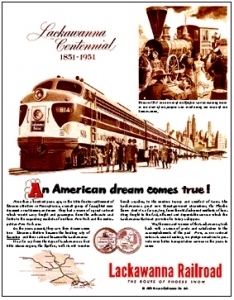 Mouse pad honoring the famous Phoebe Snow flagship passenger train of the Delaware Lackawanna & Western Railroad, powered by a set of colorful E-unit diesels. 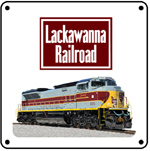 6 inch x 6 inch square tin logo sign of the Delaware Lackawanna & Western Railroads Phoebe Snow Drumhead used on its premier passenger trains. 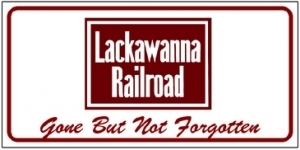 Tin sign celebrating the 100th Anniversary of the Lackawanna Railroad. 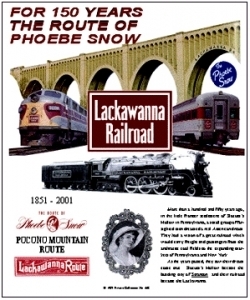 Lackawanna Tin Sign celebrating the 150th Anniversary of the Route of Phoebe Snow. 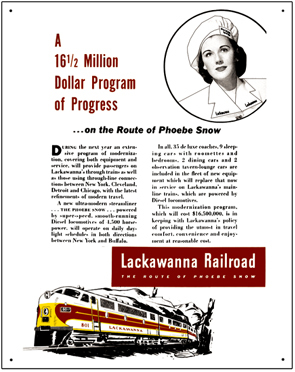 Reproduction tin sign of an advertising ran by the Lackawanna Railroad promoting its Phoebe Snow passenger Service. 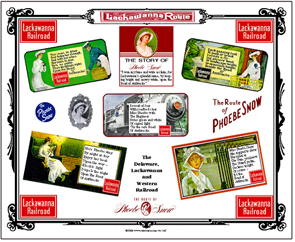 A collage of Phoebe Snow images used by the Lackawanna Railroad mostly during days of steam, as Phoebe Snow stayed clean and bright on the road of anthracite. Phoebe Snow sign No. 2 has more images. 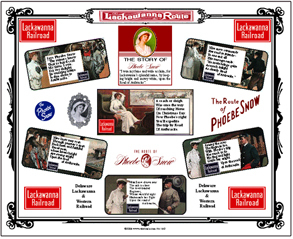 Another collage of Phoebe Snow images as used by the Lackawanna Railroad in steam days, as Phoebe Snow stayed clean and bright riding on the road of anthracite. More Phoebe Snow images are on sign No. 1.